Above ground (AG) tanks are set according to local laws and regulations on the ground near your home/office and away from any sources of ignition. They are usually painted white, aluminum, or some other light reflecting color for safety reasons. AG tanks are ideal for consumers in mountainous areas, where burial is not possible, and those with a satisfactory place in their yard for installation. 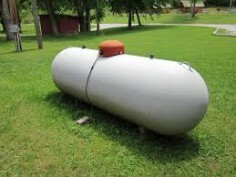 These tanks are more accessible by your propane dealer for filling and maintenance. Underground (UG) tanks are designed to be buried in the ground and are completely out of sight except for the dome covering the valves for servicing the tank. A tough chemical and water resistant coating is applied at the factory. This factory-applied coating is designed to be the final coating for the tank prior to its burial in the ground. UG tanks are also provided with an anode bracket that your dealer can use to provide additional anode protection against corrosion.